Welcome to Our Awesome Work’s new home. 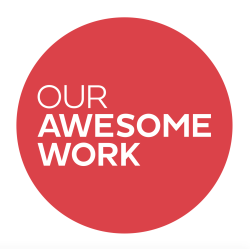 Our Awesome Work and…XYZ has combined their skills and experience to move into a new arena of design and development. We aim to grow into an international agency which develops and funds young startups’ ideas and businesses’ to the full potential they deserve. More info to follow soon. But if you want to know more about us please read below. Our dynamic design-duo, James Kennedy and Yolandi Schreuder, met in 2008 on their first day of their Industrial Design course at university and immediately became friends – working together on projects soon after. Through their love of design, determination and strong work ethic, they assisted each other through their challenging course, to successfully graduate in 2011. They founded Our Awesome Work in their last year of university, 2011, coincidently on International Industrial Design Day. In November 2015, …XYZ design and Our Awesome Work amalgamated to combine the two entities skills and experience. Dunstin Maree is a qualified Physiotherapist. He is the Ergonomics and User Experience director. He came on board when he met James and Yolandi at an event. They started talking, and immediately knew they could work together and build great products that can really benefit users. Taariq Latiff studied with James and Yolandi, and they have been working together ever since. He joined the team to handle all the users interface, content and graphic design for the agency. Our Awesome Work continues to live on as the concept development arm of the business where …XYZ will continue to bring ideas to life and into the market. Thriving on the ethos of Form Following Function and finding pleasure in the intricacies of the behind-the-scenes design process, James and Yolandi’s need to embody functional and aesthetically pleasing design into their daily lives led to the simple birth of any idea, soon developing into a concept, then a prototype and ending up as a lamp, table or a bike rack! It was Tony Gaskins who said, “If you don’t build your dreams, someone will hire you to help build theirs.” – James and Yolandi wanted to be the architects of their own dreams. It has been a challenging four years so far, and with the help of all of their friends and family through the good days and bad, they’ve made it this far with smiles on their faces and the same determination they started with. This is their first product that they’re taking to the international market and they have worked incredibly hard to satisfy their unwavering dedication and commitment to designing for the user and bringing the user something that people really need – not what they only simply want. James and Yolandi spend every waking hour designing, working and building their dream. They are the epitome of perfectionists and will not give the consumer a product that they’re not whole heartedly behind and truly confident in. This is why a seemingly simple idea took them two years to develop. And the fruits of this labour is truly remarkable. The …XYZ team consists of senior professionals with many years of experience in disciplines ranging from product design, human centred design, innovation management systems, design thinking, IP protection and project commercialisation. With James and Yolandi taking over the reigns and steering the vision for …XYZ into a more product centered business. James is a qualified industrial designer who’s multi-skilled, do-it-all innovator and problem-solver with a special interest in the technical and manufacturing side of the industry. His work has been exhibited and published both locally and internationally. He is the co-creator of Baya- the DIY desk for kids with Yolandi. Coming from a family with civil engineers and a creative household, he grew up in a strong critical thinking, creative and engineering environment. Through this, he gained vast knowledge and work experience with the best quality materials and newest manufacturing processes available. Yolandi is a qualified industrial designer whose work has been exhibited and published both locally and internationally. She is the designer of Baya- the DIY desk for kids, which was one of 22 nominees for Icsid – International Council of Societies of Industrial Design’s inaugural World Design Impact Prize 2011. In 2013 the Baya desk and the designer was invited to the MAK – Museum of Applied Art, Vienna to form part of their Nomadic Furniture 3.0 – New Liberated Living Exhibition. The publications Nomadic Furniture 1 and 2 co-authored by ecological design pioneer, Victor Papanek and Prof. James Hennessey (1973/74) and Enzo Mari‘s Autoprogettazione project (1974) are important references and starting points for depicting the DIY movement as a contemporary phenomenon. When Yolandi does not practice industrial design, she works as a decor stylist. Her work has been published by Britain’s best-selling modern homes magazine, Living Etc Magazine UK. She also assisted with the production and conceptualisation of a book titled, 50 Upcycling Projects: From Trash to Treasure, published 1 September 2015 by Human & Rousseau (Pty) Ltd.
Roelf Mulder was the founder of …XYZ Design almost 15 years ago, and one of Cape Town’s leading designers; a pioneer in the field of product design and a leader in Innovation and Design Thinking methodology in South Africa. We have a large team of professional designers, copywriters, video editors and web developers. Please head over to our Project site www.lea.bike/about to meet the team.